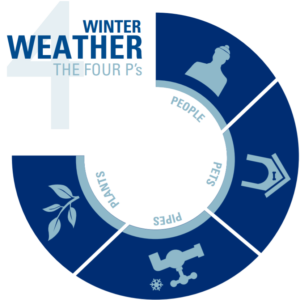 When temperatures drop, it’s important to remember to protect the 4 Ps (People, Pets, Pipes and Plants) during cold temperatures. People should dress warmly, in layers, to avoid hypothermia (abnormally low body temperature). Pets should be brought indoors or provided with a warm place to sleep. Pipes that run outside or under a house should be wrapped in pipe insulation to avoid cracks due to water freezing in them. Plants may need to be covered or brought inside to avoid frost damage. Give themselves extra stopping distance. Wet conditions means it takes longer for vehicles to come to a complete stop. Ensure windshield wipers are in good working condition before heading out on the road. When conditions are wet or dark, be sure to use headlights. Never use high beams in urban areas. Highway overpasses and bridges pose the highest risk of icing. Take extra precautions when driving over them. Slow down. Rain, sleet and snow can limit visibility, giving drivers less time to recognize danger. Slowing down gives provides extra time to adjust to changing conditions. Make sure you have a working smoke alarm. Never leave children unattended in a room with a space heater. Children knock over space heaters especially if they are placed on top of wobbly tables or stools and near where the children play. Children may also stick paper or toys in the grates of the space heaters especially gas space heaters. The city had two reported fires in 2004 caused by children playing with space heaters. Never overload outlets or breakers Don’t use extension cords for the heater. If the cord is hot to the touch, turn off the heater and unplug it! Electric heaters permanently installed in the wall or ceiling should have lint and dust removed regularly. Lint and dust will burn! For additional information on safely using space heaters, visit houstonfire.org.